Tickets can always be reserved in advance by contacting Derry and Debby, tel: 01384 560462. Get there early to book your spot as Singers' Nights are very popular and slots are limited However, to be sure, it would be best to book a spot in advance by contacting Debby & Derry either by phone or email - contact details are on the home page. Making their Woodman debut tonight we have 4 piece band Ashes To Oaks, although band member Robin Tudor has been a regular at the club for many years now. Robin is on violin in this line-up and the other band members are Jemma Lauren - Vocals, guitar and baritone ukulele, Russ Sargeant - double bass, guitar and vocals and Andy Shepherd - drums and percussion. They bill themselves as “UK-based, four-piece folk band that err on the side of good, alternative country music!” Sounds good to me. Jez was last with us in May’15 appearing with his partner Kate Bramley……(the apple of his eye, hmm??) However, unbelievably, you have to cast your mind back to May 2012 since his last solo performance with us…..7 years!! That just doesn’t seem possible to me but apparently it is so. A prolific songwriter, gifted musician on several things with strings and a sartorial star of the stripey jumper/T-shirt, so sit back and enjoy a long overdue visit from one of the North East’s finest – Jez Lowe. Although we have hosted Mick Bisiker with Nigel Ward in various guises over the years, to my knowledge we have never presented the band under the Rack and Ruin banner before, so as well as Mick on 6 and 8 string thingy’s and Nigel on fiddle we will also have Chris Radley on bass and Deb Gomme on saxophone. They all have many years experience performing lively celtic, roots, and folk-rock music and we take pleasure in welcoming back two old friends and meeting two new ones. It’s been just over three years since Clive appeared at the club. He’s been a regular guest at the club for almost 20 years and is without doubt one of the most respected singer/songwriters on the folk scene today, both here in the UK, in mainland Europe and also in the States, where he has lived for many years. His songs have been covered by many top international performers, he’s appeared as a member of Richard Thompson’s band, toured with Nanci Griffiths and his now defunct, but long term partnership with Christine Collister was simply magical, as is his more recent collaboration with Liz Simcock. A solo artiste for many years now, he remains a very busy man, but he always tries to fit in a show at the Woodman whenever he’s over here. Well what can I say about Dave Love? Dave is a much respected local singer/ songwriter and has played the Woodman many times in the past (although not for many years), so it's just brilliant to welcome him back. He has probably got the most hilariously twisted outlook on life possible and his quirky songs reflect this brilliantly. They are mainly funny renditions of the human condition, but several small animals may also feature from time to time. All of Dave's songs are cleverly written, so look out for the not so obvious double entendres and mystery titters hiding in his delivery. Oh and watch out for his quick-fire sense of fun, he shoots from the hip with deadly accuracy!! Having recently delighted our merry throng at singer’s nights we have now elevated the Fragile Hearts to a well deserved night of their own. Steve Nesbitt and Helena Rosewell formed this contemporary folk duo just a few months ago, but have already started to build a reputation as highly captivating performers. Steve’s songwriting, haunting melodies and accomplished guitar playing will tug at your heartstrings. Helena trained as a cellist at the Royal College of Music in London. Her enchanting cello playing brings a depth and beauty to the music that makes The Fragile Hearts a unique and engaging experience. Welcome to the Woodman folks. Tonight we are proud to welcome back our old friends “The Riskies.” It’s been a fraction over two years since we hosted them after we’d all thought they’d packed it in, but no, they’re touring again and even better that we’ve got them to delight us at the club this evening! We’re all familiar with the wonderful musicianship and vocals of Ruth & Ken Powell but now with the addition of Dave Walmisley (known to us through Other Roads), we will be in for a real treat. Wonderful vocalists, superb musicians…..what’s not to like? October ’16 was the last time we hosted Gary and the band so it’s certainly time for this return visit and fitting that they provide the finale to this excellent season, Gary is a singer-songwriter from Liverpool, with a voice so reminiscent of Paul Simon that he has recently completed a tour entitled “Something About Simon” in homage to his muse. His debut CD, ‘The Cabinet Maker’ was released some while ago to great acclaim. As many of you will remember from his previous visits Gary has penned some beautiful songs so the night will be filled with his own stuff plus, maybe the occasional cover. Gary plays guitar and takes lead vocals and will be joined this time by his wife Elizabeth on fiddle and mandolin, Jon Fellowes on guitars and Dan Logan on percussion. We promised they’d be back – now here they are! Renewal of Membership £5.00 and you will save a pound off the entrance fee each time you visit the club – so five visits then it’s all savings. Makes sense! 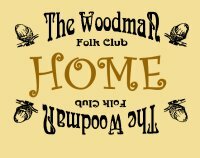 Tonight heralds a welcome return for the Woodman’s favourite chanteuse, our very own Flossie! She was last with us on the finale night of the summer 2018 season and gave us a memorable night as always. As most of you will know Flossie has been a club regular for many years now and certainly enjoys coming to the club as much as we love to have her…….she never quite knows what to expect from the Woodman audience, and we never disappoint her! With a delightful voice and her trusty Gibson guitar she will no doubt refer to her à la carte song list and bring us some chansons d’amour with a dash of savoir-faire to enhance our joie de vivre!! Welcome back Flossie. This should be a really interesting and entertaining night. Kuschty Rye is the title of a song by the late lamented Ronnie Lane and that gives us a clue as to what we have in store tonight. Enter Des Horsfall. Thirty years on he’s trying to capture the spirit of Lane’s endeavour on a trilogy of albums that he hopes will reflect the original Ronnie Lane & Slim Chance releases. The first two albums, ‘The Good Gentleman’s Tonic’ and ‘The Bastards Tin’ are already available and the third one is a work in progress. They deliver a rootsy, acoustic based run through of blues, folk and Cajun influenced songs that approach the likes of Ron Kavana. No idea who will constitute the band tonight…..but I love surprises!